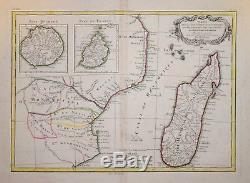 PARTIE DE LA COTE ORIENTALE D'AFRIQUE AVEC L'ISLE DE MADAGASCAR.... Fine copper engraved map of South East Africa by Rigobert Bonne, Royal Hydrographer to the King of France. Published in Paris, circa 1778. Decorative title cartouche to upper right. Measures 290 x 410 mm. A guaranteed genuine antique map. The item "EAST AFRICA AND MADAGASCAR BY BONNE, C. 1778" is in sale since Thursday, August 30, 2018. This item is in the category "Antiques\Maps, Atlases & Globes\Africa Maps". The seller is "sharp340" and is located in London.